As the snow fell and the world re-watched the greatest movie ever made in 1987, a baby was born. And he would be known as Jeffe Rodriguez. At the age of 1, his parents let him watch Ghostbusters for the first time. Even though he could not speak yet, he was a Ghostbuster at heart. At the age of 2 he had his first Ecto-1. 20+ years later, after having served his country in Afghanistan, he is back to bust ghosts like he busted terrorists. 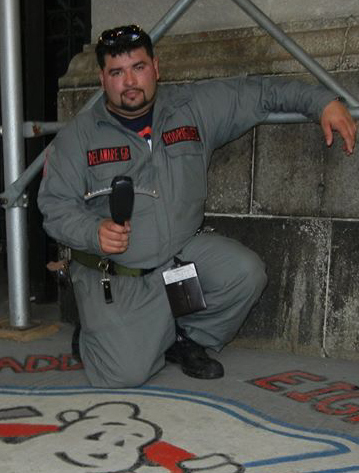 With 6 years of service, 6 Ghostbusters tools, and 6 levels of attitude, he’s ready to send the ghouls back to hell. Well, at least trap them in a containment unit.